In our previous installment, Take the Breath, we talked about how important it is to think before you shoot, and we got into some specific questions to ask yourself before you do. Why this? Why here? Why now? Why in this way? These questions want you to turn off auto-pilot for a moment, and make conscious decisions about the picture you’re taking. If you missed that installment, take a few minutes to go back and read it. If you really want to take nicer photos in your everyday picture-taking situations, you’ll be glad you did. This time, we’re going to expand on just one of those questions and discuss it in more detail. “Why this”. In regards to this question, the “this” is your “subject”. And, rather than discussing why you might want to take a picture of this subject (that was in the last installment), we want to look at what this subject even is. Subjectless photography is a common problem leading to a plethora of crappy photos from all kinds of situations. It happens when the person taking the picture hasn’t decided what the main thing in the photo is, often as a result of not running through those questions from our last installment. You might not recognize a subjectless photo if you saw one, because you swiped past it before you could even take time to decipher what’s happening. A subjectless photo has lots of different elements all calling out for attention and carrying different meanings at the same time, or it’s a photo where nothing calls out for attention at all, and asks for no meaning to be assigned to it. In short, nothing is happening, or too much is happening and there’s no reason to care. This is, of course an over-simplification. There is such a thing as an interesting and intentionally subjectless photo, but it’s irrelevant to today’s discussion. All you really need to know about the subject in photography is what your subject is, and how it might relate to the meaning of the rest of the photo. When I say “know your subject”, I don’t mean know it from the pages of a book or from constant hard, cold research (Though yes, if you’re taking photography super seriously, that’s probably a good idea too). No, I mean know it like, know what it is. In a lot of situations where you’re tempted to pull out your phone to take a picture, recognizing your subject isn’t hard at all. On the kid’s first day of school, the subject is your kids. But, in other situations, it might not be so obvious. For example, taking a picture at a concert—is the subject the band, or is it the stage, or what about the crowd pressed up against the stage? Or in another example, taking a picture of lots of people dancing at a wedding, who or what is your subject there? Here is where so many crappy photos are created—the person taking the picture doesn’t know what the subject is, and just points the phone and captures whatever they get. Identifying, or choosing your subject when taking a photo is most easily done by narrowing down what you see until you identify the core of what it is you want to capture. Think about that photo on the kid’s first day of school, the easy answer is that the subject is the kids. But, narrowing that down, it could be the clothes they picked out themselves, the backpack they’re so proud of, or the smiling, nervous facial expression they’re wearing. Looking at a more complicated example, if you’re at that concert, the incomplete answer is that your subject is all the stuff up in front of you, but narrowing it down, it might just be the lead singer, or it might just be the guitar players riffing with each other, or maybe it’s the intensity the band is performing with, or facial expression when the singer belts out a particularly good line. When you’ve found the core of your subject, put a pin in it because the subject isn’t what the photo is of, it’s what the photo is about. People tend to think the subject of the photo is whatever takes up the most space in the picture—if the subject is your kid’s smiling face, then it must be a close up. But, that is not the case here. Because, like all visual mediums, photography has a kind of ‘language’, and when we say the subject of a photo, we mean the photo is on that subject. A book about dog grooming is not just the definition of dog grooming repeated over and over, it’s a collection of ideas, and thoughts and information about dog grooming. In photography, everything else in the photo, ideally, is in some way about the subject. Once you’ve identified a subject, you can see how those things around it relate and tell a story about, or describe the subject. This lets you make purposeful decisions about what to include in a photo and what to exclude (or crop out later). A child’s smiling face can be the subject, and when you identify the smile as your subject, you can see how the bowl of ice cream or the gift they just unwrapped describes that smile and makes the photo about that smile. And the same is true for those subjectless photos we talked about before. On the dance floor at a wedding, grandma and grandpa sharing a rare dance together can be the subject. Knowing that, you can see how moving around so that the bride and groom are somewhere in the background helps to describe how this subject is a rare thing. 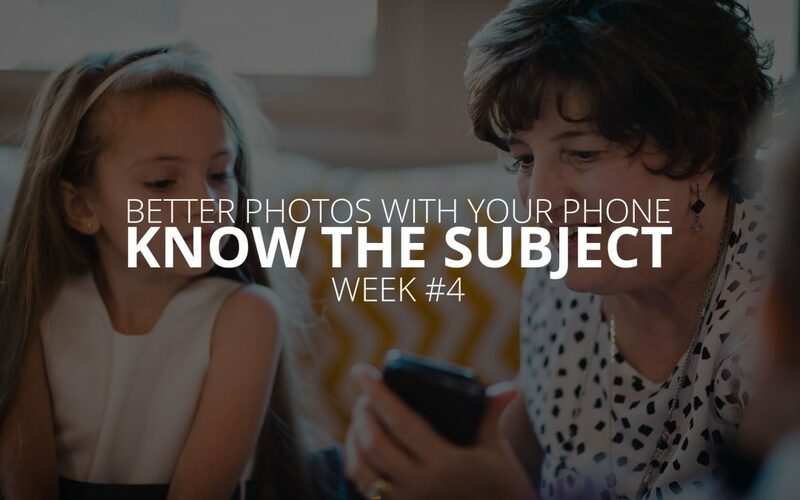 Try this—the next time you pull out your phone to take a photo, and identify a subject, look around and see what else is nearby that relates to your subject. Look for things that help to describe the subject. This could be other people, objects, places, even times of day. Try to incorporate these things into the photo and your images will have more depth and meaning, and most importantly, you’ll get more out of looking at them. Knowing your subject takes some brain training. It’s not hard, but it definitely requires that you “take the breath” and you put some intention into the photo you’re taking. Join us next time when we’ll be talking about tenacity, practice and staying positive. If there is something you’d like us to cover in this series, send us your tweets and lets start a conversation.